Manuel, a character from the BBC sit com Fawlty Towers. In one episode “communication problems” , his boss Mr Fawlty attempts to make the waiter lie about a bet he has placed. Any similarity between any fictional and real characters are purely coincidental. National Grid and contractors were at Sheepwash Local Nature Reserve and the surrounding area undertaking works on their overhead lines in Spring 2014. There had been a supposed liaison between John Satchwell and National Grid (according to Chris Moore and Matt Darby some months earlier), but he had totally failed to communicate with those present at that meeting that this site was a Local Nature Reserve and that any damage they caused whilst on site would need to be rectified, as well as not damaging some of the habitats. This would need Matt Darby and others to later have meetings on site with National Grid- another example of how the senior parks manager does not involve any discussions with his staff- or put Council interests on this site first. A number of complaints were made to the council about the contractor’s behaviour on site, leaving gates unlocked in particular as well as that picked up by the council rangers themselves. On the day after raising issues with Paul Smith about a vandalised lock on an internal gate at the site to stop off road bikes, which he noted to fix, imagine my surprise to find National Grid contractor staff angle grinding off the whole gate. I queried what they were doing and contacted Paul Smith who spoke to them, only learning that they had been given permission to do this by whoever they had had the meeting with. Sandwell Valley staff claimed to know nothing about this. Obviously Paul Smith was left red faced that just hours earlier he was attempting to fix a gate, and now someone had come along with council permission to remove the entire bloody thing! This conversation involved reporting some issues, as well as attempting to ask him what he knew about the goose culls. HE IS AFTER ALL THE NATURE CONSERVATION OFFICER FOR SANDWELL. 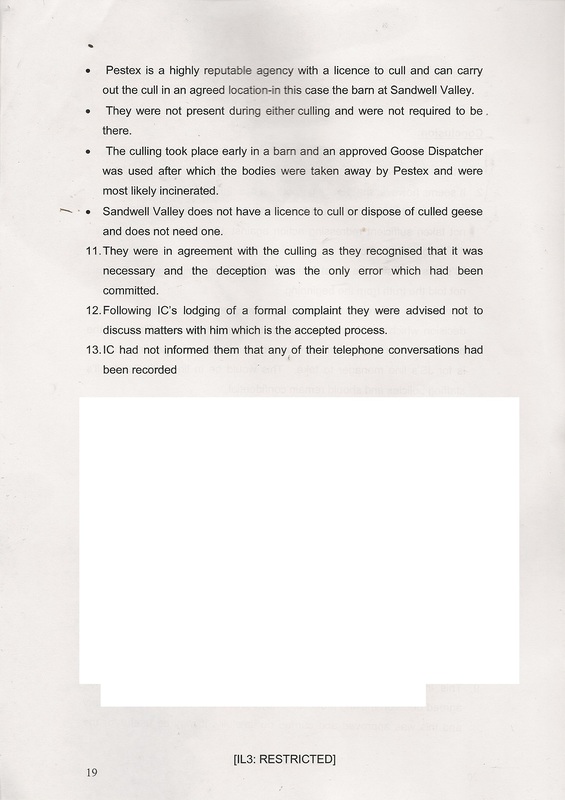 KEY PARTS CONCERNING THE GEESE ISSUE ARE IN ENLARGED TEXT. The transcript of the conversation, recorded in two parts is detailed below *1/2 denoting the split. IC These, erm Western Power, do you know what they’re doing down here, messing around by the pumphouse? PS Western Power?….. No not unless there’s some sub- contractor to National Grid. I haven’t …I wasn’t aware of them particularly being on site. IC They seem to be digging some trench where they put that wooden fence. PS It must be to do with (national Grid), I’ll try and fInd out, they must be sub- contractors to National Grid I would think. IC I just hope they lock the bloody gates, I think I’ll go out that way, see if they’ve shut em. PS Yeah, yeah, erm I mean we haven’t , erm National Grid have been ok since we mentioned about keeping the gates locked, so I don’t know who this lot are, erm , well give me a call back if they’ve left the gates open, and I’ll get onto National Grid, they must have details of contact numbers. IC I don’t suppose you know anything about this goose business do you? 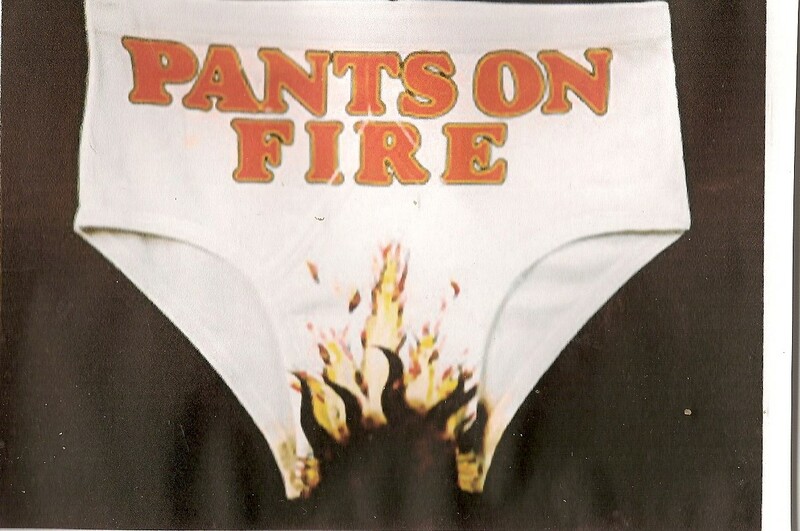 PS No, as I say, again, I’ve been off, I haven’t… what’s happened? 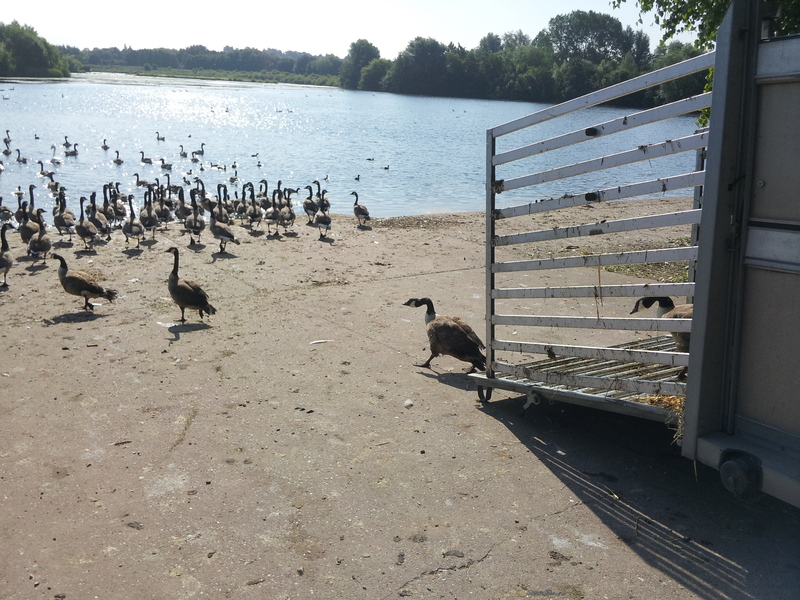 IC Well 70 odd geese have disappeared off Victoria Park Tipton, like they did last year (by the pest control company)..
IC Now last year it was alleged, and Matt Darby sent me a picture of them unloading them out at Forge Mill lake, so I very much doubt if Natural England have given them any licence to have let them do that, so I think it was done because I’d found out about it. This year John Satchwell claims they were “relocated” again to Sandwell Valley. PS Yeah I don’t know nothing about that, I’ll ask Matt if he knows anything. Nothings been said to me. IC Well Chris Moore said he didn’t know anything about it, so if they’ve brought them to the park farm or the other, Forge Mill farm, and then picked up by somebody else, would that be theoretically possible? PS Well I wasn’t here, erm no I’ll ask around, but I’ve certainly not heard of anything, nobody’s said anything… no I’ll try and find out. IC You can’t ever remember any report being written about anything like this, about relo.., erm exterminating or culling geese? PS No , No , nothing’s ever come past me, I ought to be told..
IC See they usually set you blokes up as the fall guys, talking about “biodiversity” and all of this business*1/2 and it just seems to be people at the top making decisions, without any consultation. I mean there are alternatives to this and I know they’ve tried egg pricking, what have you, but this is a disgusting thing to do. There’s some park funday on in a couple of weeks time organised by this Councillor Khatun and I just wonder whether it’s all in aid of this? PS I really don’t know Ian, nothing’s come my way, I mean I’m certainly against anything like that, It’s not been done with anybody consulting me. IC So that’s the park friends group that know nothing about it, no one at the valley knows nothing about it, the nature conservation officer knows nothing about it.. it seems like one man has taken it upon himself to exterminate, getting a load of pest controllers company, probably with public money and exterminating them. IC If you ever need a walk around..
PS Yeah I’ll try and get that sorted out, has the scaffolding all gone now? IC It’s gone along with that toilet they’d left behind for a few days, I put a couple of those metal 25kg weight things behind the fence because they were obviously going to be chucked in, some of the sandbags have been chucked in the river anyway, and those height barrier things , to weigh them down, sort of thing, erm but there’s still some clamps left last week where the EA (ENVIRONMENT AGENCY), had mowed, but I managed to intercept them stopping them going all the way because there’s still swans on the river, so they’ve mowed to the edge of the bend. PS Yes well we’ll arrange a site visit and make sure everything’s going to get reinstated that they took out. IC But the EA were late in cutting that apparently because of these National Grid, and they said they gave them a week to put all these stones and that on the pumphouse, but they still haven’t done it. PS I’ll try and find out about that as well. Alright then Ian, thanks for that, and I’ll be in touch soon and have a site visit. PS Alright then, cheers, bye bye. PART 1 OF THIS CONVERSATION CAN BE HEARD BELOW. PART 2 OF THIS CONVERSATION CAN BE HEARD BELOW. 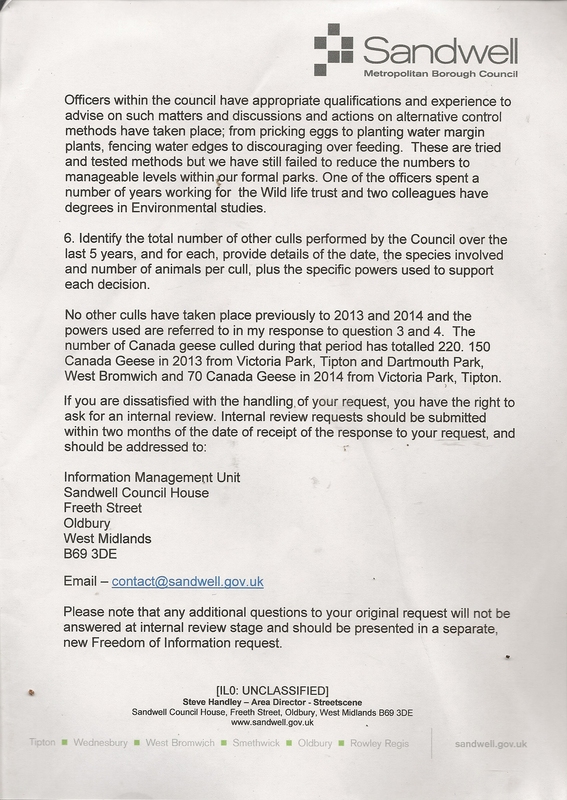 It is clear that when asked about his involvement in any discussions and report concerning culling of geese, Paul Smith repeatedly states that he knows nothing about this, nor had any involvement in any council report. Compare this with the statement issued by Steve Handley Streetscene Director at Sandwell council in a freedom of information request reply dated 17th November 2014. In the case of the officer who he refers to working in the wildlife trust, I believe that he is referring to Paul Smith- whose statements made in this phone call conversation to myself do not support Mr Handley’s claims at all. Following the revelations from the independent investigation concerning officers conduct and lying, it is clear that Paul Smith was one of those lying. Let us look in detail at his comments of August 2014, compared to the statements attributed to officers in the February report, a mere six months difference. 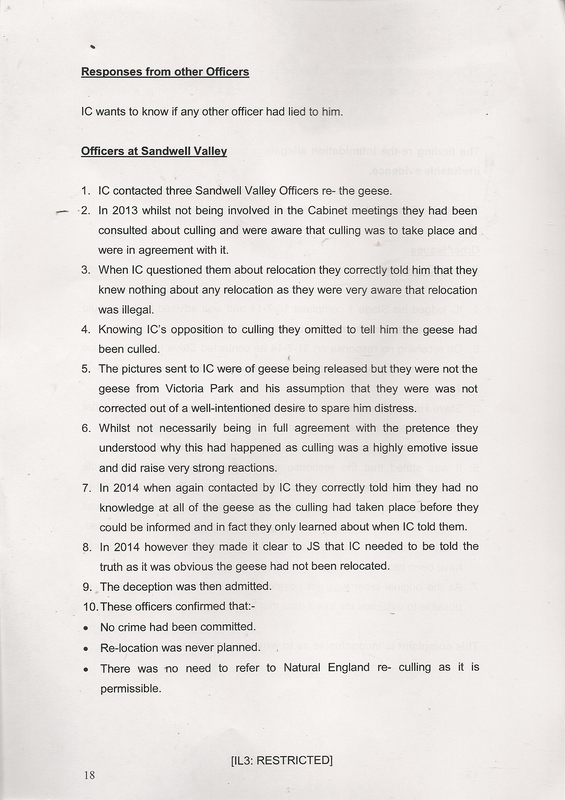 I have to say that of the three Sandwell Valley officers implicated in this deception, the one that I am most surprised at and disappointed with is Paul Smith. He seemed like a long suffering genuine inoffensive guy, and a someone who tried to do things, against opposition from the likes of Darby and Moore, who rarely ever attended meetings but sent him to take the flack.